A Village Gift Shop at the Century House, Glendale’s premier specialty boutique. Century House has been a destination for beautiful gifts for yourself, a friend, or your home for 60 years. 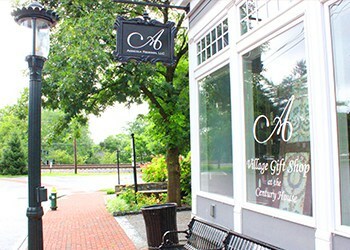 3 Village Square, also known as the Century House, was built in 1867 and sits directly on the village square, a beautiful setting for a beautiful, inviting shop. Owner Diane Agricola, an Interior Designer, brings a fresh design eye to the exclusive products available at the gift shop. The gift shop items are selected by Diane and her design team, and feature local Cincinnati designers for jewelry and home décor items, women-owned companies, as well as popular products that have been featured in Vogue, Oprah and Instyle Magazine. Popular lines range from Maruca handbags, Alex and Ani, Ella B. Candles, and more. The stylish and knowledgeable staff is warm and accommodating, with expert knowledge of the products and lines in each department. Special orders are welcome, and complimentary gift wrap is always available as well as shipping. For information, please call A Village Gift Shop at the Century House or Diane Agricola directly.